Add some fun to bath time with this scrubbie made for cat lovers with small hands. The small size also makes it great for scrubbing the corners of dishes or cleaning other small items. 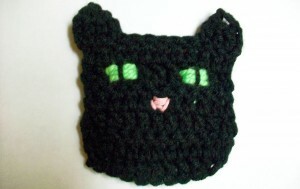 Crochet a bunch of these little cat scrubbies in a different colors to make a set. Row 7: Ch 4, tr3tog, finish off. Attach yarn to beginning of row 6, ch 4, tr3tog, finish off. Using photo as a guide embroider face to scrubbie. This entry was posted on Tuesday, May 1st, 2012 at 9:34 AM by Candace	and is filed under Free Crochet Patterns. You can follow any responses to this entry through the RSS 2.0 feed. You can skip to the end and leave a response. Pinging is currently not allowed. I can see this added to a little girls jumper for pockets. Sweet!! About the Cat Scrubbie… I don’t understand in Row 1 how I can dc in next 5 dc and then 2 dc in next dc… All I have is a chain of 12. no dc’s yet. this scrubbie can be used for the face, yes? I’m assuming you use a cotton yarn for this? acrylic really doesn’t make a nice scrubbie….and probably will not do the job. I also would like clarification of Row 1. the first comment from another Carol is correct. (I’m another Carol, and I don’t get it either!) We have a chain of 12 – WHERE are the dc we’re supposed to dc in? is there a row missing? I’d try this, but that would have to be clarified first….I am running out of time for all the gifties I have to make! It is cute…can you clarify, please? there’s not a reply to that question. Mary is correct. you’re just dcing into the chains. For body, cotton yarn is better, but some people like to use up their scratchier acrylic yarns for dish scrubbies because they scrub better than softer yarns. I think it’s just a typo in Row 1, it should read chain where she typed dc (dc in next 5 ch, not next 5 dc) and so on thru the row.